The Red Planet harbours rocks rich in carbonate minerals, suggesting there was more water there in the past than previously thought, say scientists. 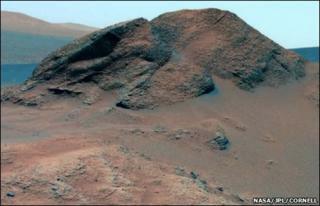 Nasa's Mars Exploration Rover Spirit detected the carbonate-rich rocks in the Columbia Hills of Gusev Crater. This was in 2005, but Martian dust had partially blinded one of the rover's instruments, clouding the data. The team described in Science journal how they calibrated the instrument to "remove the effects of the dust". The discovery helps scientists understand the early climate history of Mars and whether there could have been life on the planet. Research scientist Steve Ruff from Arizona State University in the US, took part in the study. "Small amounts of carbonate minerals have been detected on Mars before," he explained. "[But this time] we're seeing a couple of large outcrops of rock poking through the soil of the Columbia Hills." Nasa scientist Richard Morris, from the Johnson Space Center in Houston, led the research. He said that the rocks, which are about 25% carbonate by weight, contain about 10 times more carbonate than had previously been detected in the planet's rocks. "This is a significant jump," he told BBC News. "And the amount is compelling evidence that there was some kind of water there." Dr Morris explained that the mineral probably came from carbonate-rich water, which interacted with the rock. This could also point to early Mars being warmer than previously thought. "It looks like Mars had a dense carbon dioxide atmosphere, so there was some kind of greenhouse effect," said Dr Morris. "The atmosphere now is very thin, - it could have blown into space or it could have interacted with water and is now present in the rocks." The carbonate is also evidence that the water was chemically neutral, which would have made conditions "more permissive" for life on early Mars. While none of this is direct evidence of life on Mars, Dr Morris says the study is "just the beginning" of the science that will be possible with this data.